He's from Davenport, Iowa - you know, that part of the state that, when viewed on a map, looks like a nose - but, he's called Rochester, MN home for the past 17 years. And, he's an actual writer (whereas I'm a hack of a writer) and in our interview he used some really great words like "ostensibly," so I determined to put on my big-girl writer pants and not screw this up. We've crossed paths a number of times, but an official meeting eludes me. Still, his legendary status preceded him as we sat down for coffee at local hot spot, Cafe Steam. John's elementary schooled aged daughters, Abigail and Eleanor, sat at the table next to us and began a game of chess as we settled in. "Do you get tired?" It seemed like a fair first question since John is heavily and actively involved in his community. "Of course," he replied with a half smile. "Everyone gets tired. I mean for me, the nice thing is I'm not teaching in the summer, so, uh, you know, I kind of get 3 months where my full time job is being with my kids and doing all the stuff I want to do." "I didn't know you were a teacher," I said in genuine surprise. "Yeah. I teach English at RCTC. I've got a doctorate degree in English Lit." Woah. And, I thought doing a bit in seminary was impressive. (It's not, but that's what I tell my parents). "How have I not known that you teach?" I asked. "I don't know. I mean its not like a part of my public persona, I guess," he said nonchalantly. "I could learn something from you in how to write this couldn't I?" Good grief, I'm an idiot. "Ostensibly, I have some small amount of knowledge I could share." There's that great word. "So, what was your doctoral thesis?" My curiosity forced the question. "Which I've never read," I interjected as if reading Christopher Columbus' travel accounts was ever on my reading bucket list. "Well, there's good reason," John continued, "because there's a lot of stuff there that's boring, but then he writes things like, 'Oh yeah, I saw a siren off of port bow at 2:45 on Tuesday,' and saying this as if it's a factual account. Then, in the dissertation, I threw in a little bit of musicology where I'm analyzing pieces of music included with literature. I worked on The Tempest and did some musical analysis of some of the extant songs. "Where can I read this dissertation?" "The University of Minnesota. It hasn't been published, but it's somewhere in the library stacks." Taking my cue from his musicology tie in I asked him to tell me about his background in music. "I started playing in bands when I was, uh, in Middle school." "Trombone?" I asked. Hello, Captain Obvious. I mean, John's arm has pretty much evolved into a trombone slide. "Yeah. It's always been trombone. I'm kind of a one trick pony," he paused before continuing. "I studied music education at Northern Iowa and thought I was going to be a band teacher and even got certified to do that in Iowa and then didn't actually finish my degree 'cause I decided I never wanted to teach someone how to play bassoon. I mean you had to use all your fingers and both your thumbs and I was like, 'You know, this isn't me.'" "Bassoon did you in?" I asked. "Yeah. I could deal with oboe, but no, not bassoon. So I switched to English." "You know not all high school bands have a bassoon?" Do I really need to be a smart aleck all the time? "Yeah. But I thought mine should. If I was gonna do it there should be a bassoon." "Why English?" I asked bringing us back around. "'Cause I like to read and I like to write and I thought it was something I could do. I wanted to keep doing music stuff as part of my life which I did. Then, Beth, my wife, and I came to Rochester because Beth got a gig at the Clinic (that'd be Mayo Clinic) doing nursing. At that point, I was hoping to go to grad school but I didn't get accepted at the U of M until the second year I applied. "When did the D'Sievers start?" The D'Sievers is John's main group - usually a duo or trio - that plays jazz. "Um, so when I moved to town I was looking for something musical to do and my first project turned out to be with Swing Street Big Band (with whom I still playing) and the D'Sievers was an offshoot of that group. It been a long time now. Fifteen years or something like that. I've played with a lot of other projects, as well." John isn't kidding when he says he's played with a lot of other projects. Just follow him on Facebook and you'll be wondering how he keeps them all straight. "My very first paying gig was when I was in middle school. I was part of a marching band that got hired by John Deer to be part of this big show that they put on to introduce their new line of tractors to dealerships. We would march across the stage and play a song at the beginning of the show. Then we'd sit back stage for two hours and then march back across the stage at the end. I think I got paid $100 for each of those shows. I was like 'This is amazing!'" "This is what its like to be a musician! Right?" I said with sarcastic enthusiasm. Because, really folks, that's not what it's like to be a musician these days. "The crazy thing is I think we did it like 8 times. It wasn't just a one time thing." John showing his merman t-shirt to some friends at Steam. "So, what's with the mermaid? Well, not the mermaid on your t-shirt 'cause that's fairly disturbing," I said in reference to the shirt he was wearing which depicted a bare chested middle-aged plump merman in an unflattering pose. John's youngest daughter, Eleanor, jumped in, "It was a Father's Day gift. We've been waiting a year for him to wear it. "Well he's had a few to get through," I said. "Yeah. This is my first opportunity to wear it," John said in his defense. See, the thing is, from June 2017 to June 2018, John wore a different T-shirt representing a local business, artist, individual, or non-profit every day for 365 days. It was an incredible endeavor and went a long way in highlighting what an awesome community the people of Rochester are building. It just so happened that I interviewed him the day after the project concluded. And, in the interest of full disclosure, The Worthy People Project was a part of his T-shirt Tribute. Here's a newspaper article John wrote about it: "The Tail of the T-shirts"
"So, why the mermaid?" And, then it suddenly dawned on me. "Oh, wait a second! I'm just now getting it! The whole siren thing!" Alright, folks, there are days when I'm at the top of my game, but it seriously took me most of this interview before I figured out why John has an affinity for all things mermaid. "Yeah. Yep. A mermaid is another name for siren. I spent a good amount of time - at least 5 years - reading weird things about sirens and mermaids and in the process got a little fascinated with mermaids. Now, it's a thing. It's part of the band's logo. Mike King, a medical illustrator and guitar player I play with designed it one night at the Redwood Room. "Were any of the sirens in the literature you read middle aged fat men?" I asked in reference to the aforementioned shirt John was wearing. "Well, traditionally there aren't mermen. Even the name "mermaid" didn't start getting used until Chaucer (1300's CE). Before that it was always "siren." The first sirens were winged as in Odyssey. Eventually, like in Middle English some had both tails and wings which is weird. John continued, "The mermaid is really an anti-feminine thing. The tail of the mermaid is significant because it puts this animalistic fish part right where the woman's womb should be. In Renaissance England the most important thing a woman could do was to bear children, so a mermaid is a depiction of the worst kind of woman that can't even bear a child. "There's been a lot to keep women from being women." I said. "And being human." I added. "Yeah. For sure," John replied before continuing, "And this was part of that tradition which is unfortunate. When you start looking at the Odyssey - there's a direct line from the Odyssey to The Tempest to Hans Christian Anderson to Disney's The Little Mermaid. "What's your most important belief?" I asked changing gears completely. "Wow! You're putting me to the test," John paused as he prepared an answer. "You know I think my most important belief is that you need to do your best to encourage those around you to be their best. To be kind. To support yourself and through supporting yourself support those around you. I guess that's not very clear or articulate, but I guess that's my most basic belief. "What creates stress in your life?" I asked. This seemed easier for him to answer. "A lot of stress in my life is really a product of me promising somebody that I'm gonna do something like on the deadline or whatever and then maybe I'm getting close to not being able to fulfill that promise. That's a big stressor to me. If I told someone I'd have something done by a certain time that's a big deal. It upsets me if I'm gonna let someone down or not follow through on whatever it was that I promised." "What piece of advice would you give your daughters?" I asked glancing over to his girls at the next table. Hi response came quickly. "To be curious and have as many experiences as you can, but be careful." Then I directed my questioning to John's daughters. "Eleanor," I asked the youngest, "What has your dad done for you in the past few days that has made you feel special?" "He finally finished his t-shirt tribute." I guess we know how she has felt about that. "Well, that's true, but how about something for you? Something that has let you know he loves you?" "Well, when we go on secret dates. I like that a lot." "Secret dates? Can you tell me about one of those?" I inquired with genuine curiosity, "That sounds really interesting." "So on our last one we went to this paint store and painted unicorns and had a cookie and it was lots of fun. Other one's are like canoeing and I feel like we went in the sewer once." At that John jumped in, "Maybe sewer is a bit much," he clarified. "Maybe we want to say rain water runoff tunnel. There wasn't like raw sewage. It was just rain water. We like to call it "urban spelunking." I turned and directed the same question to Abigail. "Well," she said, "we always bring cold lunch to school and when dad makes our lunch he always makes us special notes out of paper or old boxes or bottle caps or things like that. We've gotten magnets and pennies or a drawing or cardboard flowers that have been spray painted." "That takes a lot of effort!" I exclaimed. And, as a mom of two school aged kids and a pre-schooler I know exactly the sort of effort packing school lunches takes let alone including fancy notes. "Sometimes it takes more effort than others," John added. "Depends on how late we are for school." I could tell the girls were getting restless so I threw out my last question. "What's one thing most people don't know about you?" I asked. "Huh. What's one thing people don't know about me?" He paused and then continued, "Well, I worked at a landfill for five years while putting myself through my undergraduate degree. It was a super interesting job. Sometimes I would be doing things like running to get lunch for all the people in the heavy machinery, but a lot of what I did was to create programs to take waste out of the waste stream that was getting buried. Like finding markets for the heavy metals that are in computers. Oh, and when we'd smash dryers we'd always find about $15 in change in every single dryer." "Did you get to keep that money?" "You'd think that in the extensive recycling programs they were developing that they'd take that into consideration, but, no they didn't have a policy, so I guess it was a perk for us poor college kids." With that we concluded with some small talk, said our goodbyes and headed our separate ways. I'm often amazed at discovering what makes people tick. How strangely fabulous that so much of John's professional studies have been about something so obscure as mermaids. Or, that mermaids, or their depiction by writers and storytellers, have shown so much of what's wrong with our traditional understanding of women and their role in society. Don't get me wrong, I still like Disney's The Little Mermaid, but it makes me wonder at the subtle messages we give our kids and ourselves. Plus, John and I got to talk "shop" (music) so that was pretty fun, too. If you haven't already, I'm sure you'll see John around town. 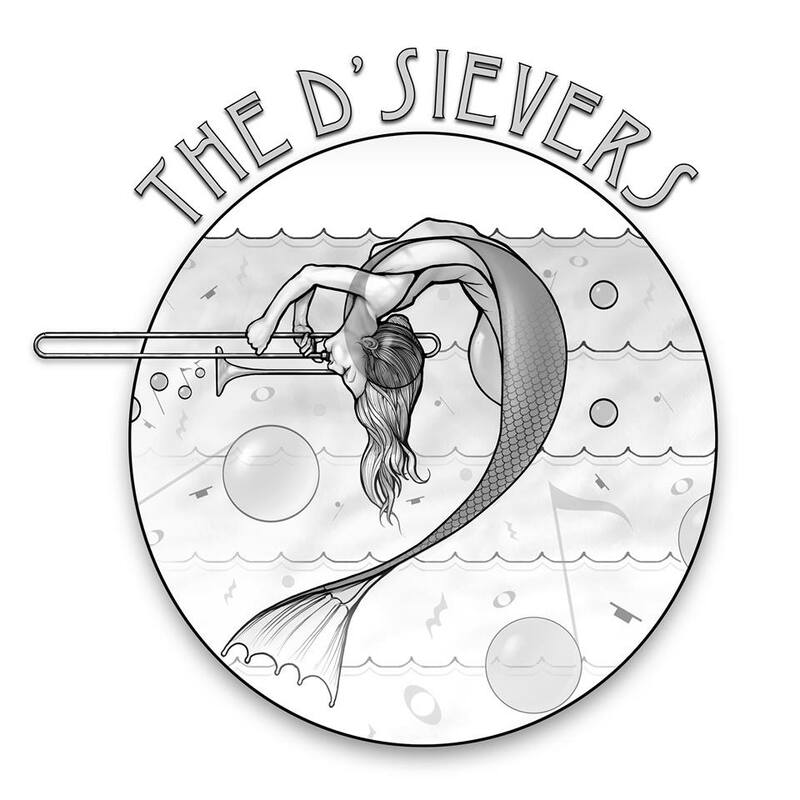 He'll probably have a mermaid coloring sheet for you while you listen to the D'Sievers play. Enjoy!